Brushed motors are less efficient than brushless motors however they are more reliable and able to withstand more abuse and punishment without failing. More Information Brushless motors are more efficient than brushed motors however they are more fragile and prone to failing under tough condition such as hard starts. 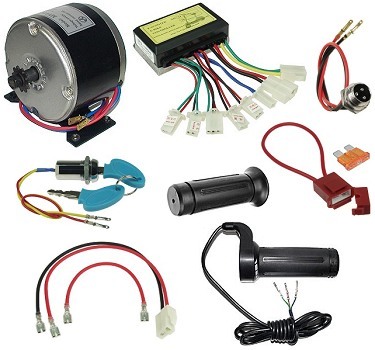 This kit includes a 24 Volt 250 Watt 2650 RPM motor, 24 Volt 250 Watt speed controller, twist throttle with matching grip, key switch, wiring harness, fuse and fuse holder. 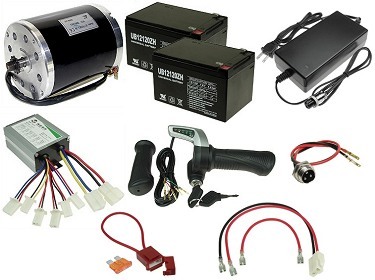 This kit includes a 24 Volt 8Ah battery pack, 24 Volt 1.6 Amp battery charger, 24 Volt 250 Watt 2650 RPM motor, 24 Volt 250 Watt speed controller, twist throttle with matching grip, key switch, wiring harness, fuse and fuse holder. 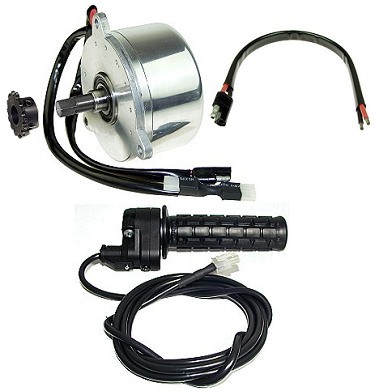 This kit includes a 24 Volt 500 Watt 2500 RPM motor, 24 Volt 500 Watt speed controller, twist throttle with key switch, battery meter, and matching grip, plus wiring harness, fuse and fuse holder. 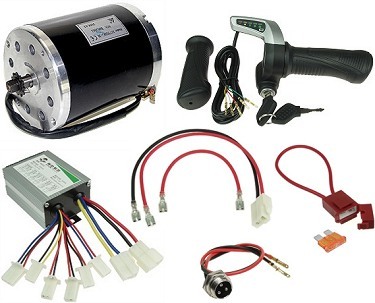 This kit includes a 24 Volt 400 Watt 1950 RPM brushless MAC motor with built-in speed controller, AWI thumb throttle, and battery pack wiring harness with motor connector. 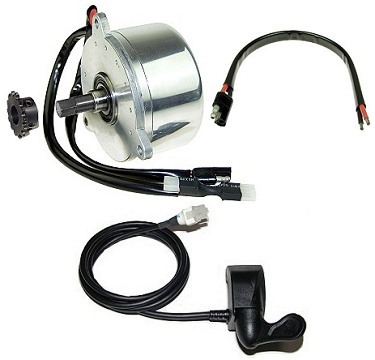 This kit includes a 24 Volt 400 Watt 1950 RPM brushless MAC motor with built-in speed controller, Magura twist throttle, and battery pack wiring harness with motor connector. We have more electric scooter power kit available. At Electric Scooter Parts we sell more than just individual scooter parts. We sell electric scooter power kits which include multiple parts all sold together at a discounted price. Most electric scooter power kits include the motor, controller, throttle, and motor sprocket. The components in our electric scooter kits are electronically and wire connector matched to each other for easy plug-and-play assembly without the worry of having to attach new connectors. These kits are designed for re-powering old electric scooters or for making new electric scooters from scratch. We do not recommend using our electric scooter kits for electric bicycles unless a gear reduction transmission is installed between the motor and the rear wheel, otherwise the motor will lug and possibly overheat. 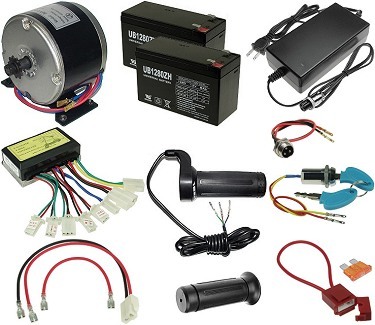 For power kits specifically designed for electric bicycles please visit the Electric Bicycle Kits page.